Look, we’re not Kansas City, Texas, or either of the Carolinas. We’re up here in the new North, which isn’t exactly a BBQ mainstay. That being said, Minneapolis and St. Paul are not a lost cause, either. Some places are making amazing ribs, and we’d like to call them out for being the heralds of Northern BBQ that they are. Here are our top picks for the best BBQ in the Twin Cities. Located right at the intersection of Franklin Ave and Lyndale, this place has been a staple for Twin Cities BBQ for over 40 years. With offerings that include both BBQ and St. Louis-style racks of ribs, moist BBQ chicken, and pretty decent brisket, it’s easy to see why it's been smoking it for so long. A small South Minneapolis BBQ spot, Smoke in the Pit mostly sticks to chicken and ribs, but it also does a pretty decent Southern-style, cornmeal-breaded catfish. If you can get in before 2pm for the lunch specials, everything is pretty cheap. This might be the BBQ gem of South Minneapolis. These Southside folks are utilizing hickory and cherry wood to fuel the flavor of their tender, juicy pork ribs, fall-off-the-bone beef ribs, and BBQ sliced beef. Everything sounds and smells so good that it’s hard to know what to choose. 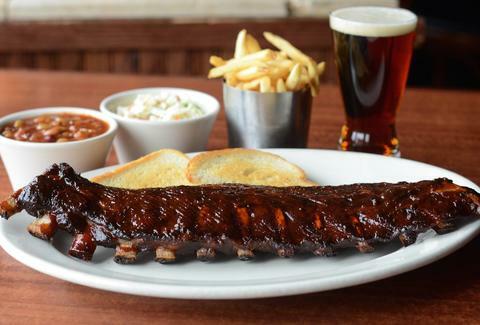 The rib tip dinner comes highly recommended, so who are we to argue? This little hole-in-the-wall is basically a takeout-only kind of place, but it's turning out some pretty killer ribs and decent chicken. Plus, you can’t go wrong with a side of potatoes, slaw, and beans. Drooling yet? Having opened in 2014, FireBox Deli is still considered to be relatively new in town. But it's also one of the few places that steers the focus off ribs and, instead, goes out of its way to highlight the luxuriousness that is brisket. Its tender, moist beef starts with a secret dry rub before the meat breaks down in the smoker for 12-14 hours, leading to one of the best smoked brisket experiences you can have in the Twin Cities. 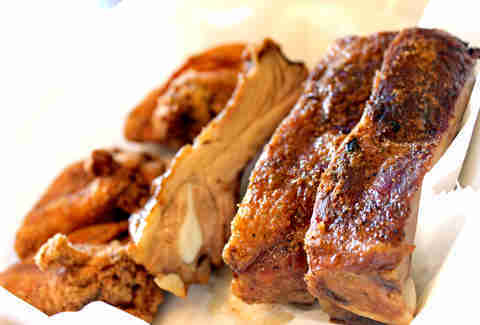 Starting off as a pair of friends having some amicable BBQ throwdowns in a park, Bid Daddy’s has come a long way, serving up delicious racks of pork ribs and chicken. What sets it apart from the rest of the competition, however, are the phenomenal beef ribs. They are truly an under-appreciated delicacy, and this place does them proud. Pork, chicken, and beef are key at this St. Paul smoke shack. Featuring beautifully cooked baby backs, smokey BBQ chicken, and tender, pit smoked beef ribs, it also offers other classics like succulent pulled pork shoulder sandwiches and buckets of crispy fried chicken. Easily one of my favorite rib spots in town, this small Kingfield BBQ joint is consistently on point. The ribs are thick, tender, and fall right off the bone, but they still retain that perfect amount of chew. 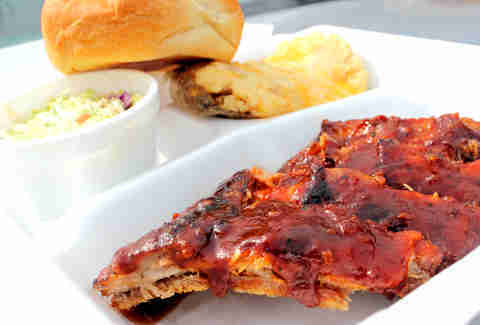 The sauce is tangy with a little hint of spice that highlights the ribs perfectly. 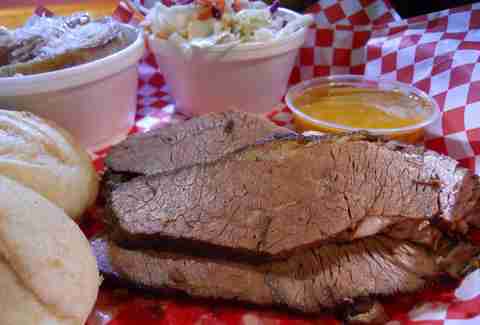 And the brisket ain’t too shabby, either! OK, I usually try to stick to the Twin Cities (Minneapolis and St. Paul specifically) when it comes to things like this. But when you’re working the kind of meat magic that owner and executive chef Shawn Smalley is working, then it’s worth mentioning. In fact, the food is so good that the folks over at Food Network proclaimed the jerk chicken at Smalley's to be the best -- ever. This place goes so far as to use real Jamaican pimento wood for its smoking to give it that extra kick of authenticity. It also has the goods on link sausages and spareribs. This quaint little place out in the northern suburbs has been rocking the Q hard, and soon, it'll be bringing that love to the Twin Cities with the opening of a South Minneapolis location right near Hwy 62 on Nicollet Ave. With a hearty reputation for succulent, slow-roasted meats -- big ol’ racks of baby backs and mouthwatering brisket -- we are eagerly awaiting its TC arrival! Keane Amdahl is a veteran Twin Cities food writer whose face can be frequently found floating in a pile of ribs. 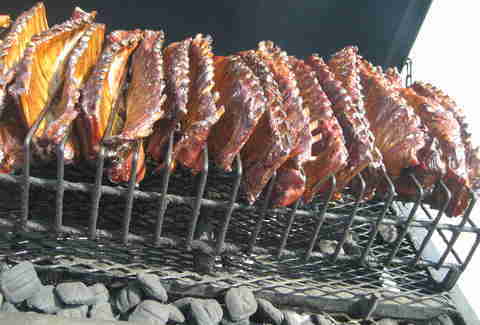 Follow his smoke-bound adventures on Twitter @Foodstoned.